Saw a post on social media that sparked a conversation, about The Black Leadership Council. I actually came up with that name, but not this concept. I can't even take full credit for the 'people' selected to at least, get us started. Organization Matters so much especially in times like these. Some of my favorite 'sayings' on the internet include that we are an unorganized truth fighting an organized lie. That's exactly why the initial image I saw was inspirational, at first. The names included Professor Griff, Dr. Boyce Watkins, Tariq Nasheed, Dr. Umar Johnson & Brother Polight. 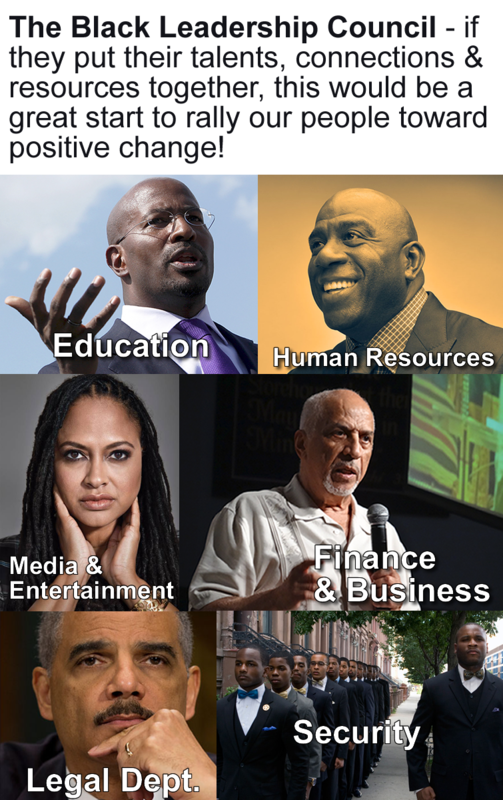 If these names are unfamiliar with you, then you are probably not 'following' the conscious community right now. You're also not watching the archive of videos at #TheBlackFolder as Dr. Boyce Watkins is featured on quite a few. (Black Choices & Wealthy Agendas) These are a good start, as the original image suggested. I still remember something that Magic Johnson said at one of Tavis Smiley's 'State of the Black Union' meetings. He said we have too many chiefs and not enough Indians. A black leadership council makes much more sense. Due to all the things we have been through as a people, it's unrealistic to expect all of us to 'follow' One person. Especially since we do indeed, have so many chiefs. We have so many people that want to be that NEXT black leader to uplift the community, that unfortunately at times they bump heads. That in my estimation explains some of the 'beef' that broke out between Dr. Umar Johnson and Dr. Boyce Watkins earlier in the year, over comments made about the all boys school Johnson's been talking about building. All of that aside, several of these men are controversial in the views that they have. While the purpose of the black leadership council would be to bring us all together. We are divided enough as it is, already. So while the first list of suggestions are indeed, a 'great start' ... what about this list? If YOU have other suggestions, feel free to leave them in the Comments below. OR simply use Hashtag #TheBlackLeadershipCouncil on IG or Twitter; we'll do an update in the future if people decide to nominate their own, Black Leadership Council members. Imagine, if they were able to work together what a message that would send to the rest of us, about how important for us to be working together.